Kim Jong-Il said North Korea remains committed to nuclear disarmament through dialogue, Pyongyang's official media said Saturday, a year after quitting international talks on its atomic arsenal. During a visit this week to Beijing, he also said ties with China will be unchanged by the "replacement of one generation by a new one," amid reports he is paving the way for his son to take control of the isolated communist state. In remarks that will be closely examined by the international community keen to usher Pyongyang back to the negotiating table, Kim "expressed the DPRK's (North Korea's) willingness to provide favorable conditions for the resumption of the six-party (disarmament) talks." He declared that the North "remains unchanged in its basic stand to preserve the aim of denuclearizing the Korean Peninsula, implement the joint statement adopted at the six-party talks and pursue a peaceful solution through dialogue." 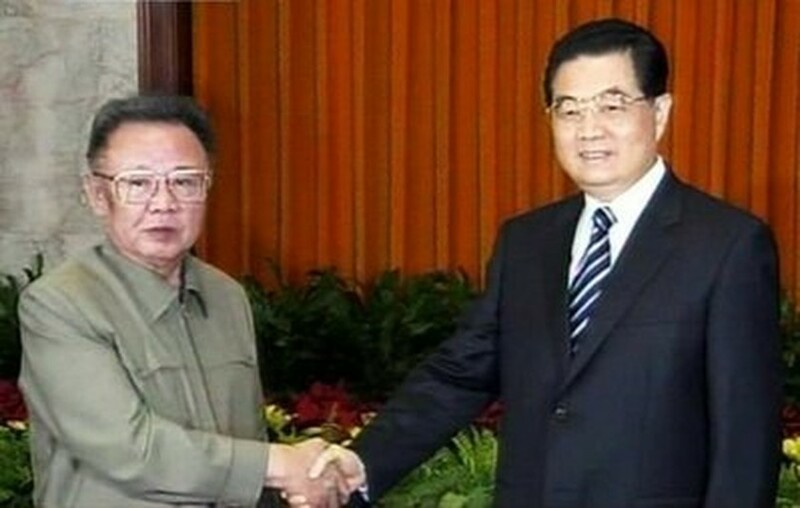 This TV grab from CCTV shows Chinese President Hu Jintao (right) shaking hands with North Korean leader Kim Jong-Il during a meeting in Beijing, on May 5. The comments, carried by the official Korean Central News Agency (KCNA), came with the first North Korean confirmation of a secretive five-day trip to China and echoed statements made by official Beijing media on Friday. "Both sides decided to make joint efforts to attain the objective of denuclearizing the peninsula in accordance with the stand clarified in the September 19 Joint Statement," KCNA said. North Korea, which has tested two nuclear bombs, last year bolted from the six-nation talks, which group the two Koreas, China, Russia, Japan and the United States, under which it had agreed to give up its nuclear programme in return for badly needed aid and security guarantees. 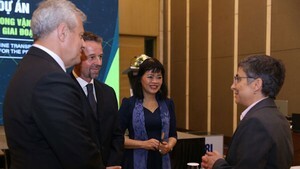 The reclusive regime eventually said it would return to talks after pressure from China, its main ally. But the North later said it wanted to negotiate a permanent peace treaty with Washington before nuclear dialogue. South Korean and US officials indicated that the resumption of talks should wait for the outcome of an investigation into the unexplained sinking of a South Korean warship near the border with North Korea in March, in which 46 sailors died. In comments likely to stoke speculation that Kim is grooming his third son, Jong-Un, for succession, the reclusive leader -- who himself inherited control of the nation from his father Kim Il-Sung -- referred to the stable relationship between Pyongyang and Beijing. "The long-standing DPRK (North Korea)-China friendship will remain unchanged despite the passage of time and the replacement of one generation by a new one as it stood tempest and test of history," he said. Hu, speaking at a state dinner hosted in Kim's honour, said the traditional friendship is an asset that both countries have a historic responsibility to maintain and improve "along with the passage of time and convey it down through generations," KCNA reported. Professor Kim Yong-Hyun of South Korea's Dongguk University said expressions of bilateral friendship lasting for generations were commonly used at summits between the two countries. "However, it is noteworthy that this rhetoric was repeated at a time when the North is believed to be raising Jong-Un as an heir," he told AFP. "I wouldn't be surprised if the North Koreans, during the visit, briefed the Chinese side on their plan for a possible succession by the son and Chinese people listened to them carefully." Succession speculation has intensified since Kim senior, 67, reportedly suffered a stroke in August 2008. He is widely thought to have chosen Jong-Un to inherit power. Information is scant about Jong-Un, the second son of Kim Jong-Il's third wife Ko Yong-Hee. Some reports say Jong-Un, born in 1983, attended an international school in the Swiss city of Berne under a pseudonym. Kenji Fujimoto, a former personal chef to Kim Jong-Il, has described the son as "a chip off the old block" who closely resembles his father physically and in terms of personality.